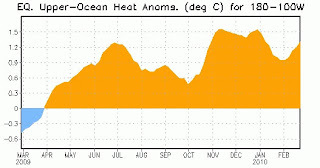 A moderate-to-strong El Niño continued during February 2010, with sea surface temperature (SST) anomalies exceeding 1.5oC in parts of the equatorial Pacific Ocean at the end of the month. The 30-day Southern Oscillation Index [SOI] to 6 March was -11. Contributing pressure anomalies are +1.3 hPa at Darwin and -1.0 hPa at Tahiti. The 30-day mean SOI reached the lowest value since 12 March 2005 of -23.8 on 12 February. The SOI remained negative since 11 October 2009. The monthly SOI for February was -14. Indications of an effective El-Nino. Graph shows almostreaching '98 levels. In Southeast Asia, millions of people are likely to remain without water for the drought caused by the arrival of Nino. In the Mekong River region, where more than 65 million people live, the water level is at its lowest level in over 30 years. In Thailand, the biggest exporter of rice in the world, the drought has affected 36 provinces out of 76. These are all located near the Mekong River; most of the crops of rice and sugar are concentrated. The drought has reduced water reserves by 15% and 4 million people have already been forced to ration water. In Indonesia and Malaysia the entire palm oil industry is in danger. The situation even more serious in the Philippines.The drought has already caused more than 25 million euros in damages and the lack of water in the hydroelectric power plants has thrown the country into a severe energy and food crisis. Nearly all models predict decreasing SST anomalies in the Niño-3.4 region through 2010 . The majority of models predict the 3-month Niño-3.4 SST anomaly will drop below +0.5oC by May-June-July 2010, indicating a transition to ENSO-neutral conditions near the onset of Northern Hemisphere summer. El Niño impacts are expected to last through the Northern Hemisphere spring, even as equatorial SST departures decrease, partly in response to the typical warming that occurs between now and April/May. Expected impacts during March-May 2010 include drier-than-average conditions over Indonesia. Predicting when El Niño will dissipate and what may follow remains highly uncertain. Should be observed for our South-West Monsoons. 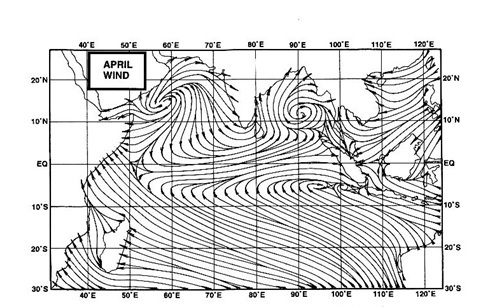 The South_East Asia region is the originating area for our Bay branch of the Monsoon. The Bay lows form from this region !